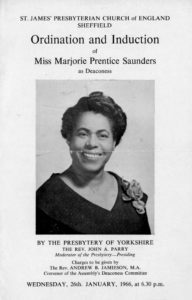 Marjorie Prentice ‘Madge’ Saunders lived in Burngreave from 1967 to 1975, during which time she was deaconess at St James’ Church on Scott Road which was then a Presbyterian Church. It is now a United Reformed Church and some of the congregation have memories of Madge whom several have described as being “a strong woman”. As a black woman, Madge’s life was a series of ‘firsts’, breaking through prejudice and discrimination in her fight for social justice. Her religion was a key inspiration in her life. Madge was born in 1913 in Galina, St Mary Parish, Jamaica. She was the first first year student to become head girl at the Bethlehem Moravian Teachers’ College in St Elizabeth and after leaving she was to make some changes to basic education in Jamaica. She studied at St Colm’s College in Edinburgh in 1948. 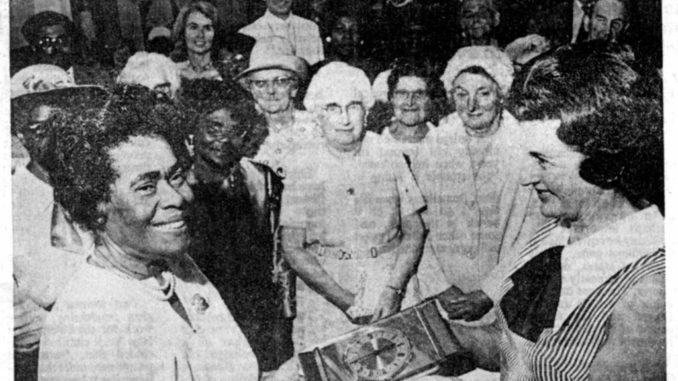 She became the first and only black woman to be ordained as a deaconness in the Presbyterian Church. Madge became a member of the Race Relations Committee, regularly spoke on Radio Sheffield and wrote a book called ‘Living in Britain’ which was later translated into Urdu and Gujerati. Unusually for a woman in those days, she became the leader of the congregation at St James’. On returning to Jamaica in 1975, she became the first ordained woman minister in the United Church of Jamaica and the Cayman Islands. Madge continued her educational, religious and social work and often spoke on Radio Jamaica. An International Conference and Retreat Centre was named after her. She was even nominated for the Nobel Peace Prize. In 2002 a group of twenty people from St James’ took ‘a journey for justice’ and went to see Madge in Jamaica. Their visit included meeting the Governor General of Jamaica who was alleged to have been in awe of Madge!